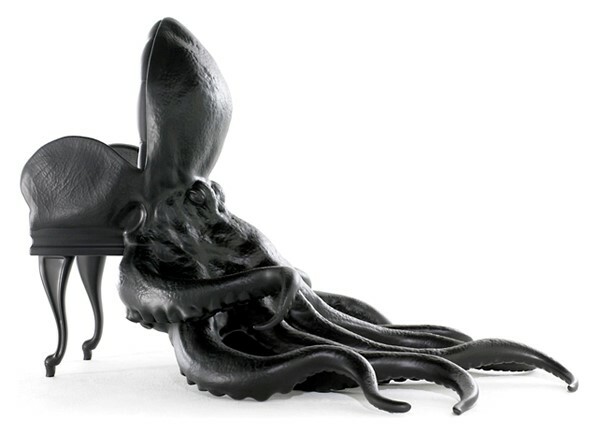 This unusual chair was designed to be as faithful as possible to the creature’s majesty and fluidity of movement. Each individual physical detail was poured over by the designer, Maximo, so the octopus seemed as real to life as possible. This perilous-looking chair has only one leg that isn’t broken, creating a clever illusion that looks like the chair will collapse at any moment. In actual fact, the chair is secured by a plate, hidden by carpet which makes it a solid cantilevered seat. Thankfully, there is no fishy odour to this chair as the sardines used were subjected to lost wax casting to create aluminium fish and not the fresh ones that would no doubt have perished long ago! Whilst this might not seem particularly weird or revolutionary now, it certainly was when it was first designed and put into production. It was designed by Arne Jacobsen in 1958 for a hotel in Copenhagen and was a shape and material that had not been seen before. 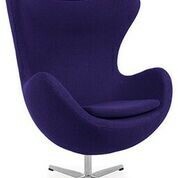 For your very own Egg Chair, visit Pash Classics. As part of a campaign called ‘The Empty Chair’, this seat was designed in support of the charity Amnesty International for their continued fight against suppression and those losing their right of freedom of expression. This is a brilliant example of function and form. The design includes functional elements combined with decorative fun. The seat is a silhouette of a coffee cup with the handle being used for hanging a handbag or a jacket from. Featuring soft folds of billowing microfibre fabric which is stitched into the steel base, this exciting chair is available in a range of colours. For those who want to create a fantasy fairy tale décor, this chair will make you feel like Thumbelina sitting in a flower. This furry chair, a cross between carpet and furniture, was designed for an Italian furniture company. It consists of metal with over-sized yarn woven through it to give it a softness. The base and seat are tightly woven with the yarn getting looser and fanning out over the floor. Kids will love having these around the dining table. They are made by bending metal into tubes, with elastic bands wrapped around them that can be closed with Velcro. Functional and fun!